Was looking in the refrigerator this morning to decide what to eat and noticed the large amount of products that had expired. My roommate had an overly large amount of yogurt that had gone bad, a liquified bag of salad and soda that had gone flat. As for me, seems like I was the biggest offender. 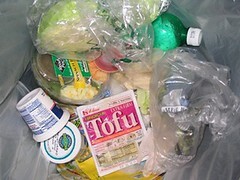 I had tofu that had gone bad last year, a bowl of salad I was planning to bring to lunch that expired last month and chicken stock. Next up… photos of the inside of our refrigerator! !